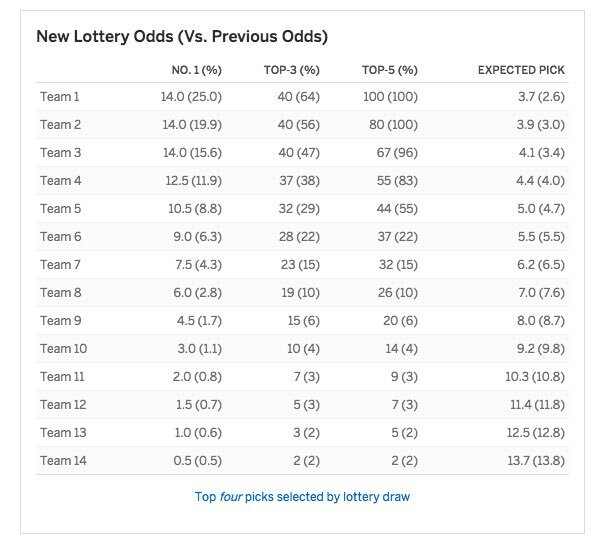 @wojespn: Sources: The NBA's draft lottery reform passed 28-1-1. Oklahoma City voted "No" and Dallas abstained. NBA needed 3/4th majority for passage. All for the resting players stuff. Not sure how much the draft reforms solve? Yeah I still only really want the multiple year penalty. All this other stuff is for the NBA's bottom line of ratings. If they really cared about teams tanking for a decade like the Sixers a whole lot more than this could have been done. It may actually mean that the "rich" potentially get richer. Lower lottery teams, like the year that Chicago (with infinitesimal odds lolz) was gifted Rose, should benefit. Heck, we may benefit from it in 2019 or beyond as a fringe playoff team likely still. The lower lottery teams, mainly WC teams for the foreseeable future, will inevitably get lucky. See, I am the opposite. The resting players rule seems like a solution looking for a problem. How will that even be enforced? How can you tell an owner that they can't rest players? What about Dirk getting the second game of every B2B off to prolong his career? Is Rick disappointing the fans in the second game? It's so hard to define and enforce that it seems like a mess and it risks the health of players. The lottery thing I like and I think it should be even more severe. Compared to the old odds, that is relatively minor. In '93, the top team only had a 16% chance of the first pick. Now it's 25% of a first overall and 100% of a top 4. We need to balance bad teams having a chance of getting better with a chance that someone who isn't the worst of the worst rising. Right now the draft is so deterministic that there is a giant donut hole in the NBA. You can either be good or you can be terrible. Being decent or bad means you're extremely unlikely to get help or improve. Plus, the teams that are terrible tend to stay terrible. Teams can just keep drafting in the top 4 and stay terrible while diverting a lot of the talent in the league from better teams/teams more capable of developing players. That hurts everyone. What's going to keep a coach from placing said player on the injury report and "resting" him? @ShamsCharania: Sources: NBA has informed teams of projected salary cap in next two offseasons: $101M for 2018-19, $108M for 2019-20, subject to change. I don't expect this to change anything for the Mavs because I see them actually making the playoffs this year and if they don't, they will just miss it which means their lottery chance should be in the 0.5 to 1.5 range. I understand the reasoning behind this rule change, but my prediction is that it just keeps the bottom teams in the bottom. It may help a few middle teams and the occasional better team. And then the owners will be discussing it again in about 6-10 years and it will swing back towards what we had. The root of the problem is that you cannot win in this league without a super star. Let's be (very) generous and say there are a legit 12-15 super stars in the league. Half your teams are already out at that point. Now, super stars are teaming up on the same team to form super teams. Of the half, now you are down to about a quarter that have legit playoff hopes. Then you get a couple of teams that have more than 2 super stars ... GSW and CLE ... now it's down to those two. Then teams have plan and hit it big at the right time of free agency, like Miami did with Wade/Bron/Bosh. This is what the LAL are hoping to do next season. Rinse, repeat. SO, the real root of this problem is you are forced to have a super star to win in this league. Why? Because star treatment is crazy. I understand no one wants to pay $200 for tickets to see Lebron sit on the bench with fouls ... or more realistically TV executives. But until we get away from a system where Lebron and Wade just have to literally fall down and get a foul call, or "Lebron has played X games without fouling out", then you will not win without one. And now, for teams that do not have a super star, their chances just went down in getting one and even worse in keeping him. Last edited by EricaLubarsky; 10-03-2017 at 03:04 PM. That isn't going to make people care about the all star game again. Make the playoffs top 16, and then we will see actual reform that makes a difference. So it's going to be 4/5 Western Conference players... No more charity for the lower-ranked EC reserves. That's gonna affect some paydays. On the other hand, it increases HB's chances of getting in. Last edited by Underdog; 10-03-2017 at 04:04 PM. 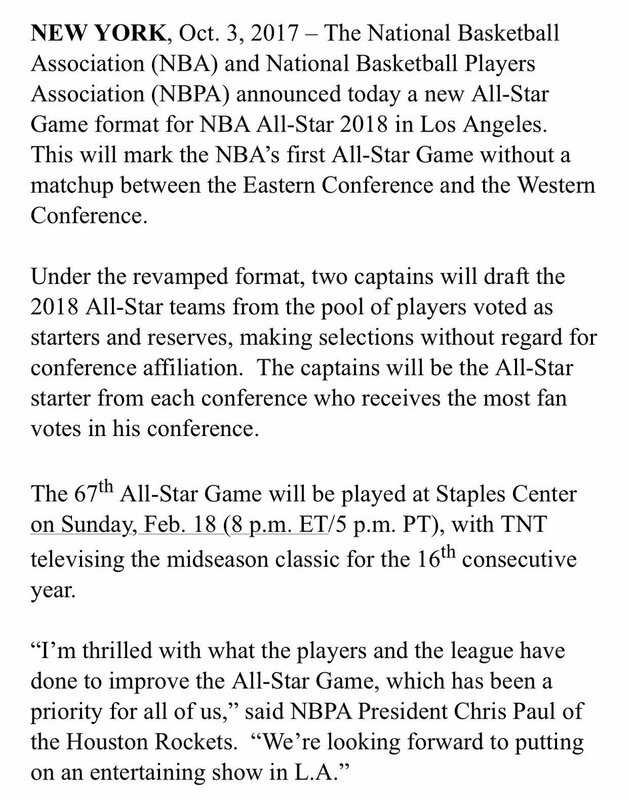 There will still be 12 players selected from each conference for the game in Los Angeles on Feb. 18. Five players from each conference will be selected as starters, with the fan vote being worth 50 percent, player vote worth 25 percent and media vote worth 25 percent. Seven reserves for each team will be picked by each conference's head coaches. Not really crazy about either of those ideas, especially the worst record automatically getting locked into the 3rd or 4th position. What's the point of having a terrible team try at the very end of the season? LOL, that's probably why nobody supported either of his ideas.